Steel is one of the most recycled materials in the world, and, as of 2007, more than 78% of steel was recycled in the United States. In the United States it is the most widely recycled material; in 2000, more than 60 million metric tons were recycled. The most commonly recycled items are containers, automobiles, appliances, and construction materials. For example, in 2007, more than 97% of structural steel and 110% of automobiles were recycled, comparing the current steel consumption for each industry with the amount of recycled steel being produced. A typical appliance is about 75% steel by weight and automobiles are about 65% steel and iron. Recycling involves melting the scrap, a process that requires only five percent of the energy used to produce aluminium from ore. However, a significant part (up to 15% of the input material) is lost as dross (ash-like oxide). The dross can undergo a further process to extract aluminum. 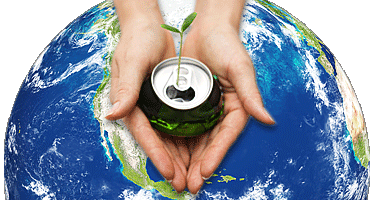 Cans are first divided from municipal waste, in utilisation of an ECS. Cans are cut into little, equal pieces to lessen the volume and make it easier for the machines which separate them.